FLARE® is an acronym for FLuorescence-Assisted Resection and Exploration in surgery. The name is also a metaphor for lighting the way to a better future for patients, their families, and the surgeons who strive to do the best for their patients. FLARE® started as a question in the laboratory of Curadel’s founder, John V. Frangioni, M.D., Ph.D., while he was Professor of Medicine and Professor of Radiology at Harvard Medical School. Could near-infrared (NIR) light, which is slightly redder than red and invisible to the human eye, be used to see under blood and tissue during surgery? Undeterred, because he recognized the impact his technology would have on human surgery, Dr. Frangioni published his first targeted NIR contrast agent in Nature Biotechnology in 2001, with this paper receiving an impressive 240 citations to date. Over the course of 17 years, he followed this first paper with over 200 others describing FLARE® devices, FLARE® contrast agents, and new ways to combine the two to perform better surgery. Twenty-six of these papers, in fact, are peer-reviewed clinical trials that have studied FLARE® in over 750 patients to date around the world. Curadel opened its doors on June 15, 2014. Since then, our team has worked tirelessly to perfect every aspect of FLARE® devices and contrast agents. We are proud to now be able to offer the technology to the researchers, veterinarians, and surgeons who want to do their very best to alleviating suffering. 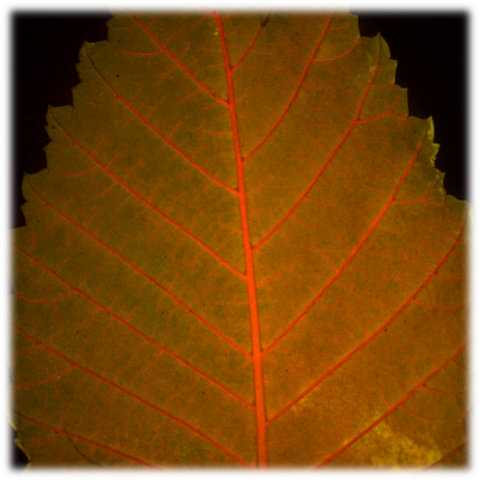 Nutrient flow in a leaf revealed by FLARE® contrast agent ZW800-1 (pseudo-colored in red) and super-imposed on the color video image.